Pre-heat oven to 375 degrees. In a small bowl, mix together the balsamic, honey and chopped shallots. Cut fresh figs into thin slices and place separated on a baking sheet lined with tinfoil. Pour a spoonful of balsamic, honey and shallot mixture over each fig, making sure to top each one generously with shallots (reserve a little bit of the mixture to top off bruschetta – if need be, make a little extra). Bake for about 15 minutes or until figs and shallots are soft. While they are baking, toast your bread. Spread goat cheese on top of the bread and when figs are done place 2 on top of each bruschetta, making sure to top with the shallots as well. Drizzle left-over balsamic, honey and shallot mixture over the top of the figs. 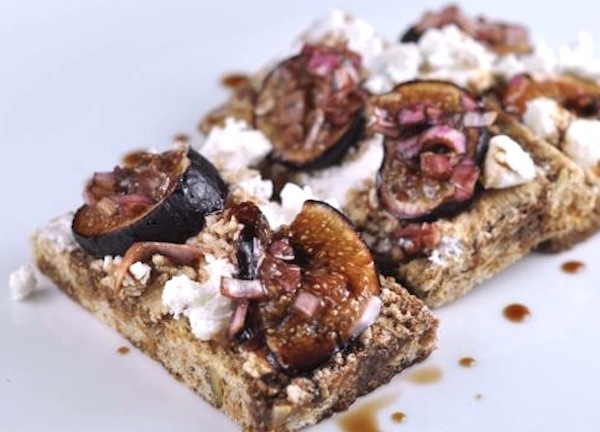 This entry was posted in Recipes and tagged balsamic vinegar, Ezekiel Bread, fresh figs, goat cheese, honey, Shallots. Just made this on a thin crust pizza shell. Absolutely delicious!!!! Yum! So happy you enjoyed… thanks for sharing, Joanna!